The focal point of the face is the eyes, and proper eye makeup application will make your eyes pop and leave them stunning. But you need to understand their shape and where to apply your eye shadow and eyeliner to really bring them out and open them up. You also need to know which shades of eye shadow and eyeliner will best enhance and intensify your eye color. Anyone looking at you should notice your beautiful eyes, not your eye shadow. The most important thing to remember about choosing eye shadow and eyeliner is your own eye color. 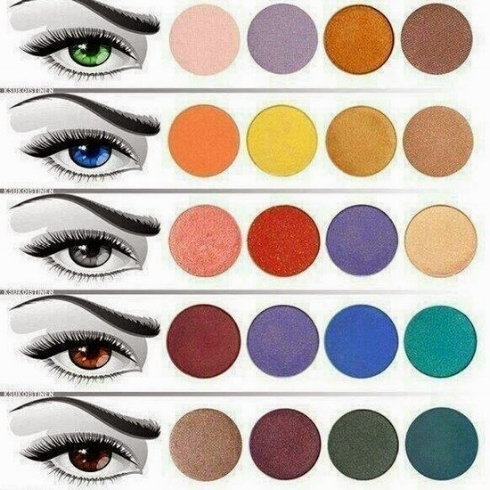 You want to select shades that will bring out the natural color of your eyes. Your goal is to make your eye color "pop" or stand out, not for your eye shadow to compete with or diminish your natural color in any way. The key is to select a color opposite from your own eye color. Whenever you pair two opposite colors, they intensify each other. The opposite of blue eyes is a warm shade of brown, or tawny or golden shades. By using shades of eye shadow or eyeliner that is the opposite of green ....coppery warm browns or purple..... they will make the green in the iris of your eyes look much more green. If you have brown eyes, lucky you! You can experiment with a variety of colors and still enhance your natural eye color. So play with purple, green, gold, navy, silver, copper, or brown. Any color looks beautiful around brown eyes; you will not be competing with your natural eye color. Hazel eyes are a mixture of colors, either green and brown or green and blue. Depending on which color you want to enhance, choose your eye shadow to bring that color out, and place your eyes in the color category you want to enhance. When choosing eyeliner, you should follow the same rules as when choosing eye shadow. In my opinion though, bronze, brown, black, and charcoal will do more for defining your eyes than bright colors and I love an eggplant liner with every eye color as well. You do not have to match your eye makeup to your clothing, although some women think you should. Makeup is an accessory to 'you'. Makeup is not an accessory to your clothing. Once again, the theory about opposites complimenting each other applies here. Choose what looks best on you. That way, you will choose shades that will compliment you, instead of taking a back seat to your clothing or eye makeup. You are trying to achieve two things when applying your eye makeup. The first is to give your lid shape by visually “pushing away” the areas you don’t want to see and “bringing forward” the areas you do want to see. Proper application will make your eyes appear more open, so they look awake, and in the end this will make you appear years younger. 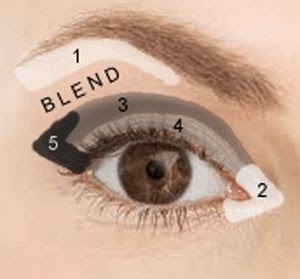 The application for all eye shapes is very similar, because you always use the same three key ingredients; you just slightly adjust their placement for each individual eye shape. It takes three shades to shape the eye: a highlight, a midtone, and a contour shade. The basic rule to remember is that everything you highlight will visually come forward or become more prominent, and everything you contour or darken will recede or move away from you. Using three shades creates a subtle visual trick to help bring out one of your most beautiful features and help draw attention to your eyes rather than your eyelids. While there are thousands of shades to choose from, everyone should use the three-shade application technique for best results. A matte finish will give you a more subtle look than a shimmer finish. The shimmer will be more dramatic. Also, the lighter the highlight shade is, the more dramatic your end result will be. A softer or more flesh-toned shade will give you a less dramatic look. The highlight shade should be applied to your brow bone, the area underneath your brow’s arch and your eyelid. 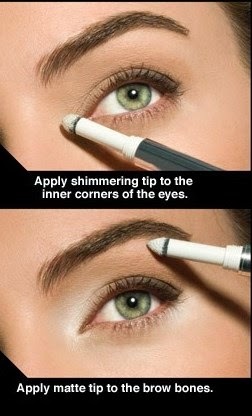 Also apply your highlight shade to the inside corner of the lower lash line. This will really help open up your eyes, making them appear larger and more youthful. Your midtone shade is the middle shade of your three eyeshadow colors, deeper than your highlight shade and lighter than your contour shade. It’s the first step in the blending process and in creating definition in the crease of the eye. This shade should be the most natural, an extension of your skin. Most of the time it is best for your midtone to have a matte finish, but it does not always have to be matte. A matte finish gives it a more subtle and natural appearance. The application of your midtone will start the reshaping of your eyelids, because everything we add depth to will visually recede away from us. midtone color, because the first place you lay your brush receives the highest concentration of color. Gently move your brush along the crease into the inside corner of the eyelid. shade, always making sure to blend it where it meets the highlight shade. Then, take your midtone and apply it all along your lower lash line. Once again, start your application from the outside corner, sweeping it across to the inside corner. but it is the eye shadow that is the deepest color of the three. Your contour shade does the most dramatic reshaping of your eyelid because of its depth. This shade really helps define the eyes. To apply, take a brush with shadow and move it across your top lash line from the outside corner toward the inside corner. You are brushing along your lash line to help create a more blended effect with your eyeliner, which is always more flattering and more youthful. Then, bring the color up into the outer portion of the crease and blend it inward, about a third or, at most, halfway across. Your goal is to create a gradation of color, with the outer corner of the eye being the darkest and becoming lighter as you move in towards the inside of the eyelid, towards your nose. By layering your contour shade on top of your midtone shade, you’ll get the blended, defined look you want. You can also apply the contour color underneath and along the lower lash line to define your eyes. Blending it over your eye pencil will also help give you a softer, more subtle lined effect. shade’s intensity. Add color in small amounts. If you need to soften your application, simply take a little loose powder and a clean brush, and brush the powder over what you just applied to soften the color.